WASHINGTON (AP) - President Barack Obama recognized one former president and 14 artists, athletes, civil rights activists, humanitarians and others Tuesday with the Presidential Medal of Freedom for contributions to society that he said speak to "who we are as a people." This year's recipients "reveal the best of who we are and who we aspire to be," Obama said at a White House ceremony. The Presidential Medal of Freedom is the nation's highest civilian honor. It is given in recognition of contributions to U.S. national security, world peace, culture or other significant public or private endeavors. Tuesday's medals were the second set Obama has awarded. Some of the loudest applause was reserved for Bush, the former Republican president who has devoted nearly 70 of his 86 years to public service, starting when he joined the Navy on his 18th birthday. He served as a congressman from Texas, U.N. ambassador, Republican Party chairman, U.S. envoy to China, director of central intelligence, a two-term vice president and one term as the 41st president. "His life is a testament that public service is a noble calling," Obama said. Bush's wife, Barbara, and their children listened from the front row. "His humility and his decency reflect the very best of the American spirit. Those of you who know him, this is a gentleman." Another robust round of applause went to Rep. John Lewis, D-Ga. Lewis was chairman of the Student Nonviolent Coordinating Committee and helped organize the first sit-ins at lunch counters that refused to serve blacks. In 1965, he led a march for voting rights from Selma to Montgomery, Ala., and was nearly beaten to death along with others in what became known as "Bloody Sunday." 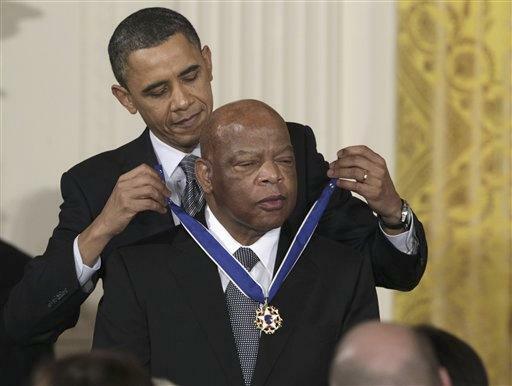 Obama said Lewis "knew that change could not wait for some other person or some other time." Lewis speaks often and loudly in his booming voice on issues of justice and equality, and is known as the "conscience" of Congress. He told reporters later that the award was all the more special coming from Obama, the nation's first black president. "If someone had told me that one day I would be standing in the White House and an African-American president would be presenting me the Medal of Freedom I would say, 'Are you crazy? Are you out of your mind?'" Lewis said. "It's just an impossible dream." A particularly touching moment occurred during the presentation for Dr. Tom Little, an optometrist who was murdered by the Taliban last August in Afghanistan. His wife, Libby, accepted and Obama rubbed her back as a White House military aide read her husband's medal citation. -Maya Angelou, an author and poet who wrote and recited one of her works at former President Bill Clinton's inauguration. -Warren Buffett, chairman and chief executive of Berkshire Hathaway. The famed investor is known as the "Oracle of Omaha" for a business savvy that has helped him become one of the world's richest men. Buffett is also a philanthropist and a leader of an effort challenging the country's wealthiest people to step up their charitable giving. -Jasper Johns, an artist whose work has dealt with themes of perception and identity. He is considered a major influence on pop, minimalist and conceptual art. -Yo-Yo Ma, a world renowned cellist and 16-time Grammy award winner who is known for his interpretations of Bach and Beethoven. He played at Obama's inauguration and at other White House events. -Angela Merkel, the first woman and first East German to serve as chancellor of a unified Germany. She did not attend the ceremony, but Obama said she'd be paying him a visit soon. -Bill Russell, the former captain of the Boston Celtics and first black man to become an NBA head coach. President Harry S. Truman established the Presidential Medal of Freedom in 1945 to recognize civilians for their efforts during World War II. President John F. Kennedy reinstated the medal in 1963 to honor distinguished service.